There are several overdubs to contend with, so I’ve tried to make things as manageable a possible for just one guitarist (of course, the reoccuring harmony parts should be twin guitars). The proper harmony for the part in question is thirds from [diatonic] natural minor but other parts of the tune are major, so be sure to disengage any effect if used. We already transcribed the song by Carlos Santana – Samba Pa Ti here. The opening musical statement under discussion becomes harmonised at bar 5-I chose the top string for the start of the higher part but you may find the equivalent notes on the 2nd string if you prefer. Observe the cut offs, which add definition and bite to the proceedings. Incidentally, an abbreviation of this section reappears a few times (see chart/transcription) and it is repeated in full as the outro. At bar 51 there’s a powerful entrance to the first solo: a unison bend which is so typical of Carlos Santana (and Beano-period Clapton). Things evolve into straightforward legato here -just fast hammer-ons and pull-offs, wiggling the old fingers around as fast as you can! Carlos obviously used a vibrato arm to steadily drop the already toggling pitches by about a semitone before returning to pitch – if you don’t have such a device then simply dropping back a fret will do the job. Just before bar 54 (and in that bar itself) there’s a bend from the b3rd to the tense-sounding 4th – an Albert King staple much copied by lots of blues/rock guitarists. Carlos always plays such a lick forcefully and with great command. Bar 55 to the end of this solo is fairly typical 70s rock guitar: minor pentatonic scale licks and relatively basic sequencing thereof. Try to make it sound urgent, though. At bar 80 there’s a sudden lead break which I’ll refer to as being ‘solo’ guitar work for the purposes of the sound advice box. It begins rather Albert King-style as before but by bar 82 it’s more reminiscent of BB King (Carlos is happy to cite BB King and Eric Clapton as influences – indeed he has a non-tuitional video available called Influences in which he elaborates). At the end of the following percussion break the second main solo enters, involving a unison bend while repicking the top string (let the held bend ring a bit each time). A hypnotic repetitive riff/motif (ostinato in classical speak) appears at bar 88 and, as Carlos is fond of doing, a wah-wah pedal is engaged for a short while. Bar 90 is perhaps similar in approach to Clapton, possibly Chuck Berry-inspired; it’s slightly confusing rhythm-wise so I’d suggest just trying to get the mood and vibe of such licks. 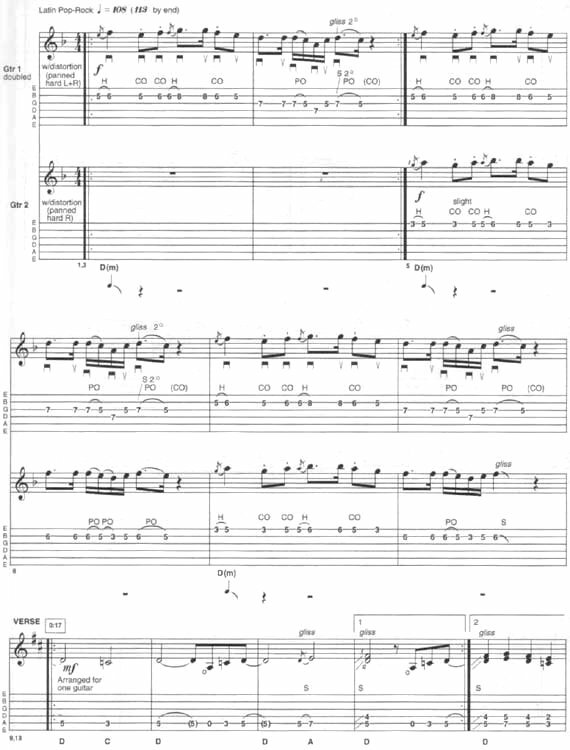 In bar 91 we get our first bluesy b5th – the boys used to be known as the Santana Blues Band but Carlos is always careful where he introduces the flat 5th scale step in relation to the standard minor pentatonic scale (R, b3, 4, 5, b7), which he generally sticks to in aggressive solos. A trademark style of Carlos’, evident in part at bar 94, is playing ascending unison bends that follow the pattern of the minor pentatonic scale as just described. He makes it wail and scream, mainly through using powerful distortion. Here, though, he tempers the aggression by playing sweeter-sounding bends in BB King/Clapton style – note the brief appearance of major 3rds, which is very ‘BB’. There follows more straightforward string-bending rock/blues licks with only the rhythmic displacement to be wary of (such playing invariably flows easily at the time yet may prove tricky to transcribe and recreate so, once again, just go for the vibe and technical approach on offer). Bending the flat 3rd slightly sharp is a well-known blues ploy and Carlos saves it for bar 98 -they’re used only in passing so you’ll have to be pretty quick noticing them and reproducing them as well! Bar 100 has some aching-sounding blues bends surely in the style of Albert King (you may think Stevie Ray Vaughan but you ought to know where he got it from). Carlos, however, injects real passion and grace into the phrasing of the lick -remember that Peter Green (one of Carlos’ heroes) really hates the idea of licks and only ever thinks in phrases. Bar 104 sees the reintroduction of that polyrhythmic riff heard near the start of this end solo – as I often preach, reintroducing parts aids familiarity and likeability. Carlos soon reintroduces that waggly legato stuff incorporating the pitch dip and return. 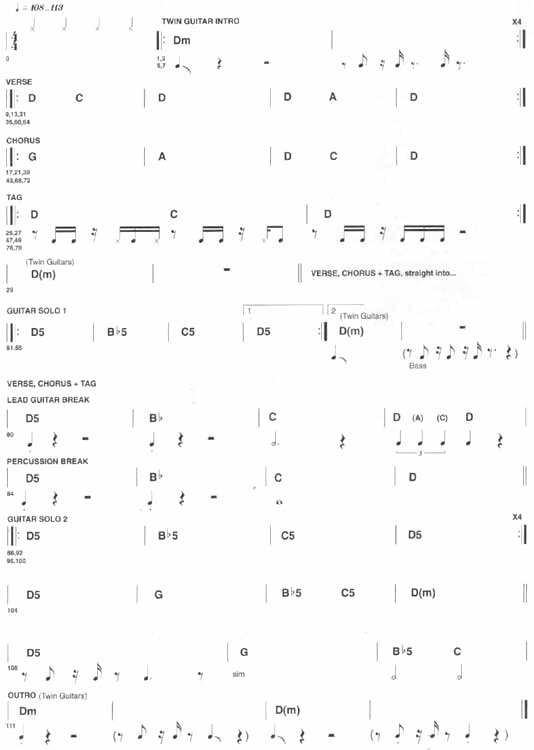 It’s just a part of Carlos Santana Well All Right guitar tab and sheet. An accurate transcription of a great song. I really like this one. Thanks guys. © 2012 - 2019 TabsClub Powered by TabsClub 40 queries in 0.282 seconds.